Siew Mai and I were hungry and thirsty after our bout of shopping, and TWG (Ion Orchard) was the nearest place for a cup of tea. The queues are normally quite long so since an opportunity presented itself, I grabbed it. We ordered their Prime Tea Set (S$26++) which comes with a pot of tea, 2 savoury brioches, 2 scones or 1 pastry from their cake selection, cream and their signature tea jelly. We also topped up with a separate pot of French Earl Grey (S$11++) since the set only comes with 1. Both Siew Mai and myself were very impressed with their extensive list of teas, which bordered on being rather intimidating because...what does one choose?! I ended up choosing a chilled honey tea because it seemed rather soothing and interesting. If you order a hot tea, it'll come in a pot similar to this. The bling you see is the teapot cozy which keeps the tea warm. 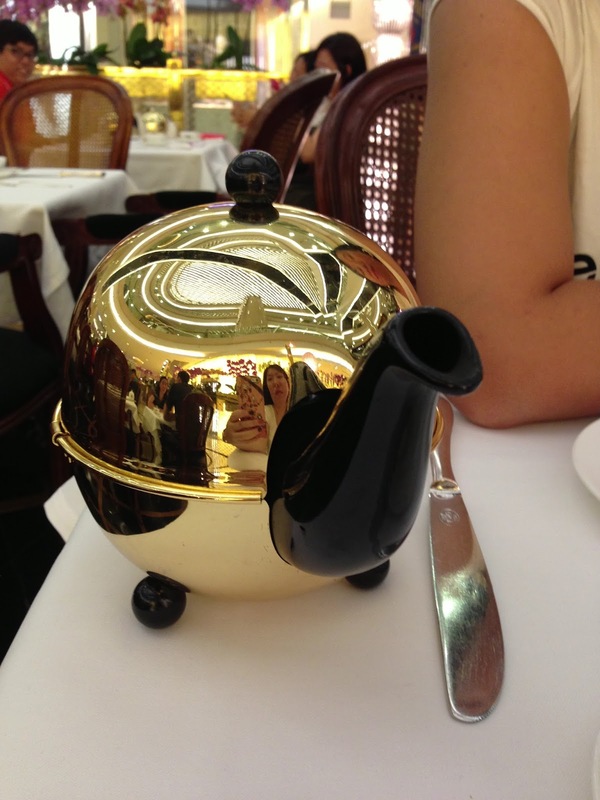 I find it very much TWG but Siew Mai called it the 'beng' teapot. LOL. Well...it's not for everyone. There aren't any tea leaves in the pot so you can forget about asking them to top up with hot water. I guess that's how they earn more money. My honey tea was rather interesting. It came with a separate small jug of syrup and I was thinking, "If it has honey, wouldn't it be sweet?" It was not. Why then is it called a honey tea? The aroma and slight taste of honey was very distinct when you sip it without the syrup. Add in the syrup and it intensifies the honey aroma! Very delicious! I guess the honey is probably from honeysuckle instead of honey honey. Our sandwiches and scones came in a very English fashion. I need to get one of these soon. For the savoury sandwiches, I went for the roast chicken while Siew Mai ordered the grilled vegetables. Both of us ended up having the 'same' sandwich because the taste of the cream cheese simply overpowered everything. To make things worse, it was just soft. There was no other texture then just a lump of soft mass. Even my roast chicken 'brioche' was soft. From the description, I thought that the cucumber and salad were in the sandwiches but I was mistaken. On to the scones. I love scones. I think if you've been following my blog, you would've known how I was scoffing my face with scones in the UK in 2009, much to the chagrin of my bro. What was impressive about the scones in TWG were not the scones themselves (they were good...don't get me wrong) but the TEA JELLY! OMG. This delightful jam was light, floral, slightly fruity and super addictive. I could have eaten the whole tub. I think the next time I ever eat at TWG, I'll just ask for a pot of their tea jelly and all the scones that I can eat. After which, I'll have to walk home from Orchard just to burn off half of the calories. LOL. The general verdict of TWG is this - slightly pretentious. The teas and anything made of the teas are quality but everything else just passes the taste test. With the prices on the menu, I might just ignore the quality tea and head to Marmalade Pantry on the 3rd floor where I know that I'm getting 10x the flavour for the same prices. Btw, if you haven't already known, the 1837 in their logo isn't the year of their establishment (which is 1995, if I'm not wrong). According to the founders, they added 1837 into their logo in respect of when tea importation etc was established. Ok...no comments on that. Would I buy their teas? Some of the basic ones are going at S$32 for 20 bags. That's $1.50 each. I just bought 20 sachets of tea from Marks & Spencer for $4.50. Hmm...do I like their honey tea that much? I do have green tea and manuka honey...but I guess if you are a tea connoisseur, TWG is more worthy of one's palate. Me? I'll stick to Marks & Spencer/ Lipton/ Whitthard's/ Twinings.